Last evening there was a knock on my door and then the roar of the UPS truck driving off. I wasn’t expecting anything. I think that is the best time for the UPS man to knock on your door. Awwwhhh, there was a large, golden envelope lying against the porch wall. I knew then it was a new book from Sterling publications and Lark Jewelry & Beading. I ripped open the top of the package and to my delight inside was “Soutache” by Anneta Valious. I have been waiting patiently for this book. Through email I spoke to Anneta last year so I knew this book was coming. I am thrilled to be one of the reviewers for this magnificent book. So let’s get started. If you don’t know what Soutache is, Anneta explains the history and modern day uses of the elegant art with text and striking photographs. If you are old enough you may remember Soutache on your grandmother’s coat and we all know Soutache on Military uniforms. 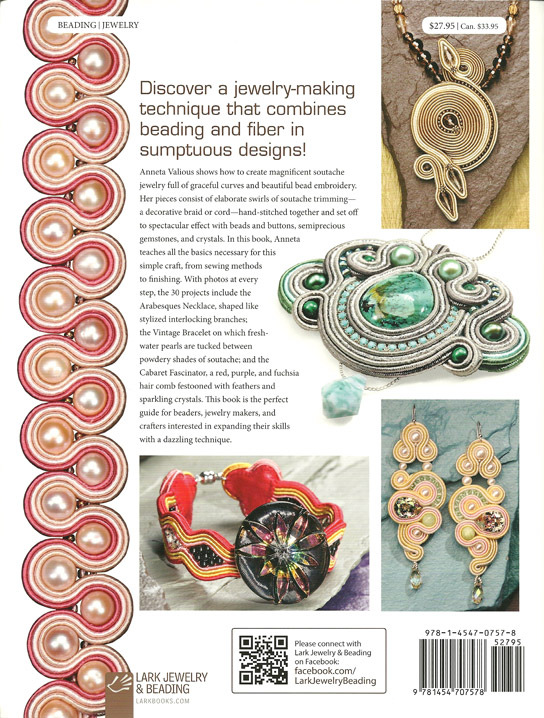 Today Soutache is one of the fastest growing jewelry techniques in the world. The combination of colorful Soutache cords, beads and cabochons has intrigued designers from the fashion industry to the home artists. Now you can learn from one of the best. 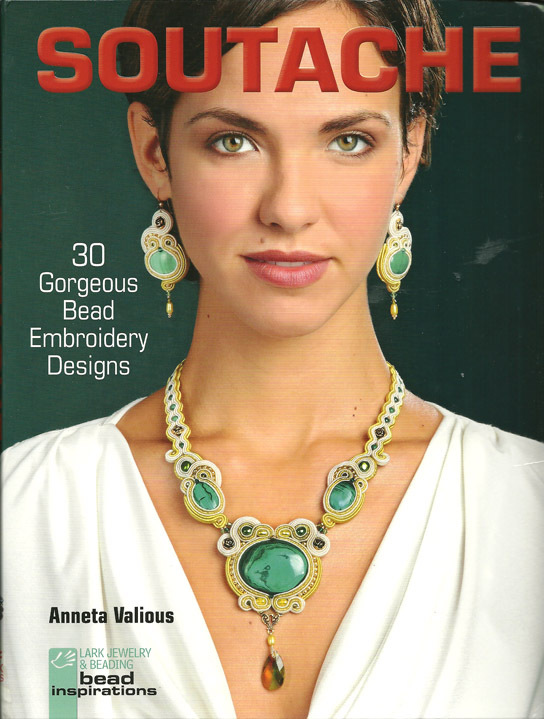 Anneta’s book takes you from start to finish on creating 30 stunning pieces of jewelry. What I found most appealing is that Anneta shows her readers old time techniques that “new” beaders and jewelry makers have not been taught, however, makes all the difference in creating a professional piece of jewelry. Once you have this incredible book in your hands you will not be able to put it down. The photographs, which are also taken by Anneta, capture all the colors, shapes, twists, and turns of the Soutache cords. Needle placement is most important in Soutache sewing and again Anneta takes great pains in explaining and showing how to accomplish this. In my own bead art, and in my classes I teach that the back of a piece must be a perfect as the front. Anneta agrees and explains excellent finished work. For me, this is one of the best instructional books out, a refreshing insight on an old art form. If you have any interest in Soutache at all this is the book you must have. Innovated, seriously fun, and will inspire you from the depths. Amee has a book coming out this Fall, also. Well well well...your review has me wanting to check this lovely out. Hope our library has a copy. The jewelry looks amazing! I don't know what soutache is, but it sounds very difficult! LOL! Oh no! Another book I must have!! I've been wanting to explore soutache and this will be the perfect way to spend the long, sunny and very hot days (100 degrees, 3% humidity) days where I live. Just got this book. Cannot wait to get started on this new journey. The instructions seem very detailed which is great when you are new to a different technique. Luckily not too many new "tools" are needed. Well...........here goes.